If you were a reasonable person, you would look away right now and not read any further. There’s a warning here and it’s not to be taken lightly. 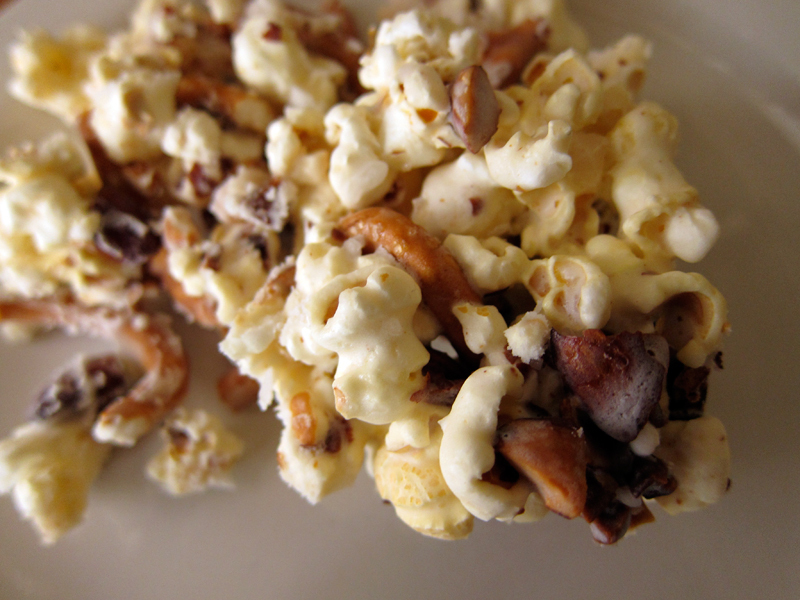 This super delicious concoction of popcorn, roasted almonds, pretzels, marshmallows and salty caramel is insanely addictive. If you have willpower, let this be the test. I saw these popcorn bites on Tracy’s site and I wanted them immediately. Instead, I waited until I knew I was having a group of friends over who would be more than happy to take these off my hands and help spread the guilt joy. And there was lots of joy to be had! While I had hoped that these would have been a cinch to make, they were a bit troublesome. Mainly because I just couldn’t get my caramel caramelized. I’ve made caramel scores of time, but this time, I couldn’t get it to turn a lovely golden shade. In fact, I waited so long for the amber colour that the whole mess went and crystalized on me. However, I was able to turn it around by adding a bit more cream (oh the guilt) and a lot of stirring. So instead of a deeply hued toffee colour, it was a light shade of beige. Who said beige is boring? Not here. Also, I wasn’t able to really cut these into bars – it was more like chunks…really, really delicious chunks. I think that was my fault because instead of just 12 cups of popcorn, I probably made 14 cups or so to help cut down the sweetness some. No one cared. Even with my crazy screw ups, these were still crazy delicious. elsewhere: Looking for something a bit more tame – but still really tasty? Over at Poppytalk I posted a recipe for an easy, delicious and perfect for Thanksgiving morning kind of quick bread: introducing Cranberry Citrus Walnut Loaf. Yummy. It’s all kinds of awesome and it only has 2 teaspoons of fat and uses whole wheat flour. Yup. So good. Butter a 9×13″ pan and set aside. In your largest bowl possible, dump in the popcorn, pretzels and almonds and toss so that everything is evenly mixed. In a large saucepan, melt the sugar, 1/2 teaspoon salt and a half cup of water and bring to a boil – please no stirring! Boil until the mixture turns into a golden caramel shade – about 8-12 minutes. Remove from heat and pour in the heavy cream – watch out, mixture will splurt! Add marshmallows and stir until melted. Pour caramel over popcorn and use a wooden spoon to mix everything together – work quickly because the caramel firms up quick and then you’ll have to use all your arm strength to pry all the tasty bits away from the bowl. Maybe next time I’ll try buttering down the bowl. If you try it, let me know if it works out. 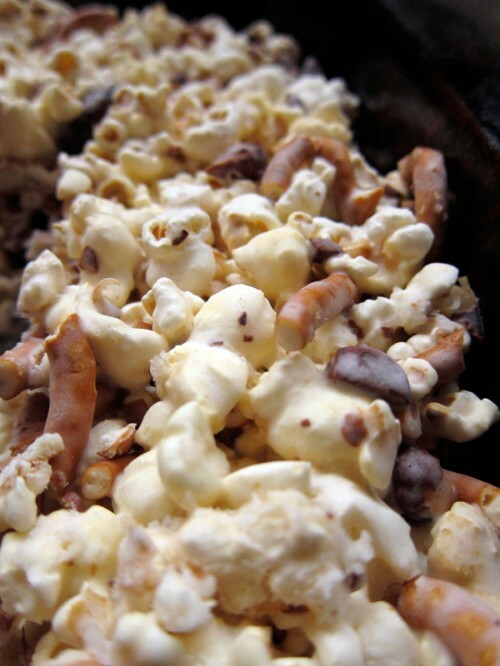 Dump the mixture into the prepared pan and press down on using slightly damp hands (helps to prevent stickiness), so that popcorn mixture is completely pressed into pan. Sprinkle with flakey kosher salt and let cool. Cut into bars or break mixture into delicious clumps. Otherwise, just enjoy the sweet, sweet crumbles and watch yourself turn into drooling, blubbering Homer Simpson. Look away because it isn’t pretty. nothing beats the combo of pretzels + anything sweet. ever tried dipping pretels in leftover frosting? HEAVEN! This recipe sounds fantastic! Perfect for a rainy day or movie night at home. I’ve been following your blog for awhile and love it! That is why I decided to give you a Stylish Blogger Award. Have a great Thanksgiving! I could have turned away until I got as far as marshmallows in the ingredient list. That pushed me over the edge. I can see how these are guaranteed to be addicting so making them for friends sounds like an excellent idea! big o’ bowl of crack! seriously. love this combo. I made homemade caramel for the first time this week and now…well…let’s just say it’s dangerous to live in my apartment at the moment. These sound seriously delicious. Oh, I can not wait to make these! 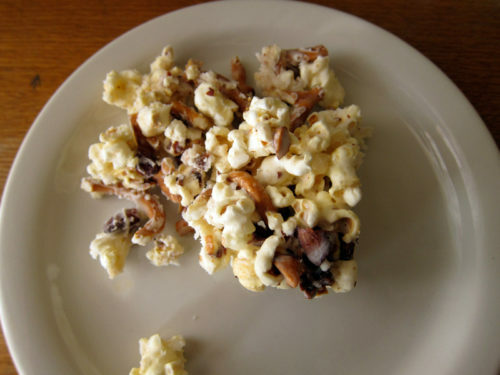 Savory popcorn isn’t my thing, but when you add pretzels and marshmallow and caramel? How can a girl resist? i’m throwing in the towel. you win. Oh man! I can’t weight to make this! This looks so good I want to curse! Yes, please. I see a big heap of this stuff being packed into tins for xmas gifts…yum! I had to LOL at Melynda’s comment. Don’t feel too guilty, Melynda! I am not a reasonable person… so i kept reading… and I’m glad I did!!! Eva, what’s up with that??! So frustrating. Kettle corn? I’m curious! Alana, I’m all about the pretzels and sweet. The Ben & Jerry’s ice cream with pretzels in it? My fave. Yum. Yes, I think making these for friends is the best idea ever, Rachel. Less dangerous that way. Oh indeed, vanillasugar. Crack attack!! Bijoux, I hope you had a great birthday and I wish I could send you some of this good stuff as a sweet surprise! You’ll just have to whip up a batch for the holidays. Joanne, homemade caramel is dangerous – this is doubly so, really. Kate I LOVE savoury popcorn, but this is a welcome (oh so welcome) treat. Enjoy! Thanks Christmas Sweets – I hope yours look better than mine too! Jessica, this would be ideal as a holiday treat. Definitely. Well thanks to you Tracy. I wish mine turned out better (squares would have been nice! ), but I liked the chunks too. Trust me, there was no complaining at all. this recipe will definitely be included in my christmas care packages! so glad i stumbled upon your fab recipe!!! thanks!! Thanks colemom, it would be fab in care packages! Enjoy. I made some of this yesterday and it is incredible! I used President’s Choice alphabet pretzels and they make the mixture look really cute. Everyone who tasted it raved about it and my babysitter had to have a copy of the recipe. Jen, that sounds amazing! I love the idea of letter-shaped pretzels. Cute!! Good call Pam! Next time I make this I’ll use brown sugar 🙂 Still delicious, either way, I’m sure! Drool! Thank You or sharing the recipe. Sorry, this recipe doesn’t work! The reason why is because of the Heavy Cream. Perhaps, this is a typo within the recipe. I love to cook and was looking soooo forward to making this. I was disappointed. Holly, sorry you couldn’t get the recipe to work. Can you tell me what it was about the cream that was the problem? The recipe worked for me exactly as directed so I’m wondering what the problem was when you gave it a go. Adding the cream and marshmallows will turn turn the mixture creamy and thick and gooey. Is that what happened? I’m wondering if I did it right, because I made it last night and I thought it would dry out and become crunchy like caramel corn. I was going to pack it in tins and give it as a gift. But even after letting it dry overnight it’s still sticky and gooey like rice krispie treats, so I’m afraid if I pack it it will just turn into one big giant blob. Is that how it’s supposed to be? Gooey? Jessica, it’s not supposed to be gooey. In fact, it dries really quickly. I know some people have had success with this recipe and a couple haven’t. No idea why – I’ll have to make this again soon. Sorry! I made this tonight and followed the recipe exactly and it turned out soft and gooey. I was bummed. Fortunately I had a bunch of teenage boys here who didn’t care. I’d love to make this but I can’t. They don’t sell bowls that big in England….lol! I just have to ask, why the cream? I mean, what does it do for the dish? Rachel, most caramels are made with cream. It adds to the texture, creamy rather than snappy. I tried this recipe this weekend and the sugar and water mixture didn’t carmalize. The water evaporated and the sugar crystalized and turned hard as a rock. In all the caramel recipes I’ve tried they called for butter to be added to the sugar water mixture. Does this recipe require butter at all? I wasn’t to happy with the results of this and will be removing it from my pinterst board. Jamie, no butter is needed here. Did you mix because you shouldn’t – mixing can create crystals that will ruin the caramel. Some people add lemon juice to hamper the crystalization process, but the cream should take care of that. Not sure what happened without more details. Sorry it didn’t turn out for you. I’m assuming the pretzels and almonds go in when you add the marshmallows? Can you just use caramel topping instead of making your own? I’ll give it a go and post what I got. Amanda, if you used caramel topping, it would remain sticky. This hardens up a bit and is quite simple to make. Let me know how it goes! I made this tonight, and while it tastes so yummy, it is gooey/sticky. I finally figured out how to fix that; in fact most caramel corn recipes call for it: After mixing, place in oven at 250 degrees for 10-15 mins, remove and stir and place in oven for another 10-15 mins. I also split it into two 9×13 pans. forgot to mention, once removed from the oven, transfer to waxed paper and spread out into a single layer; allow to cool. Had the same problem that many are having… Mine is a gooey mess. I stuck it in the oven, but all of my popcorn is now chewy and shrunken. Bummer! I just re-made this according to the recipe above and it came out even more perfectly than the first time I made it. When you pour the caramel over the popcorn, it does stiffen really quickly so you have to stir quickly & it helps to have a second person to help hold the bowl (thank you husband). No need for it to go into the oven. But it’s now ready to be cut into squares and it tastes delicious! Would it help to add “Do Not Stir!” to the caramelization instructions? Could stirring cause the sticky problem people are having? I have not tried this recipe yet but I make caramel all the time. If you are having trouble with the caramelization try this. Add your sugar to a heavy bottomed sauce pan. Add your water, pouring slowly so as not to “splash” the sugar up on the sides of the pot. Stir just enough to make sure it is combined. If there is any remaining sugar on the sides of the pot use a wet pastry brush to wipe it off. Turn the heat all the way up and do nothing from that point, don’t even touch it again until the sugar starts to turn the dark caramel color. The bubbling will slow and it might seem like it is never going to change but it will and it will happen fast when it does. Then when it reaches the color you like remove it from the heat and add the cream. Wait for the crazy bubbling to slow down then quickly stir it to ensure everything is mixed well. Don’t use brown sugar, it won’t work out the same. Caramel gets it’s color from the burning of the white sugar and brown sugar will not harden the same way white sugar will after it is cooked. I hope this helps 🙂 I can’t wait to try the recipe, I’m having my hubby stop for pretzels on his way home from work! I spayed the bowls with butter Pam. Also I added brickel bits and mini red and green m &m’s for Christmas fun. One problem….it is gooey .and has not gotten hard! Looks yummy…thanx for sharing the receipe. Dawn, you can keep it in a tightly sealed container in the fridge. Hi, this looks amazing, I was wondering do you think instead of marshmallows the marshmallow fluff in a jar would work also??? Hi Darcy, I have no idea as I’ve never used mfluff before. I’d say no. I just bought oven roasted almonds. Do I still need to toast them in the oven? I made this tonight and mine came out gooey as well. It was still amazingly DELICIOUS but it needed to harden. So, I did the same thing as Lori did, and put mine in the oven for 10-15 minutes (as I do for my regular caramel popcorn I make). It hardened and is delicious! I want to add mine definitely looked more like caramel popcorn rather than yours. Hi Erin, you any kind of sea salt, or use table salt (just a bit less though). This is like a popcorn ball on steroids! I think I needed to let the sugar mixture boil a little longer. Mine ended up being not quite as “sticky” as I would have liked . . . a little runny, but still very tasty! I used butter flavored cooking spray to coat the popcorn bowl,like you had mentioned, so it didn’t stick and that worked great! I also sprayed my wooden spoon so I didn’t really have a sticking problem at all. Can’t wait to share it with the family! I was sceptical to make this after seeing reviews mention challenges with the caramel. I have very little experience making caramel (I normally don’t allow cooking with heavy cream!) but this recipe got me. The results were fantastic! I boiled sugar water for the full 12 minutes and it was perfectly golden once I removed it from the stove. DELISH!! Can’t wait to bring them to my coworkers tomorrow! Just made this… I wish the instructions said “Do Not Stir!”, I was stirring away with nothing happening before I finally read all the comments and stopped stirring! Mine is a little gooey, I’m assuming from the stirring, but it is delicious! I’m going to try dry it out in the oven as suggested. Yep, I stirred too. Wish I hadn’t. 🙂 I think they will be turning out a little stickier. And actually my mixture had boiled so much it was starting to turn back to grains before I added the cream – I kept waiting for it to turn caramel-y and the colour wasn’t changing either. The taste, even with the gooey-ness, is really scrumptious! Cathy and Naomi, I’ve added the “do not stir” to the recipe. Thanks 🙂 Glad you still had delicious tasty, if a little sticky, treats!